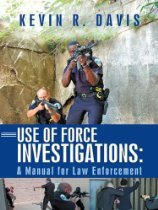 Kevin Davis has written a fantastic book ‘Use of Force: A Manual for Law Enforcement’ on the topic of police Use of Force, I highly recommend every cop read. Police are under the microscope more than ever before which puts a great deal of pressure on the police. Kevin’s mission and intent of this book is to give cops a better understanding of the topic of use of force while “taking whole of conflict” and violence. After all police use of force does not happen in a vacuum. It does happen through intense emotional human interaction, that requires adaptive decision making and should be analyzed, synthesized and investigated as such. The book is written in an easy to understand and fluid way with real life police examples reviewed and analyzed in such a way that you cannot help but understand the lessons. As I read the stories in the book I could not help but think how similar the stories were too many I have heard from cops of all ranks throughout the years. I also thought how troubling this was as it sent me the message “we clearly have a problem with even police who do not understand the topic of use of force.” Again Kevin’s mission with this book is to change that. Kevin breaks down the use of force an often misunderstood topic (even by those of us in policing) by separating the use of force myths from reality. The cascade of information perpetuated by the media, (print and television news) and the Hollywood affect (movies) develop collective beliefs of the public and police that just are not so. In use of force cases, the facts of what took place are not so clear and far more, murky, than a 3 minute news report could ever describe accurately. The so called facts, laid out so neatly by the media are not so clear, and even far murkier to the police officer actually in the encounter. Kevin takes look at the legal parameters so important for a cop to understand. He discusses the teaching techniques such as scenario based case study methods that include force on force free play and the importance of conducting after action reviews. Agency policy he discusses in a way that shows a clear understanding of how people decide under pressure and the importance of balancing policy and procedure with people and ideas. He has a great chapter on reporting use of force. Most cops hate the report writing phase of police work but it is indeed an important part. Every cop should learn to candidly document the facts of the case including all the details of the interaction from beginning to end. It’s hard for me to believe there are still cops who believe vague reports are better than detailed reports. Kevin gets into the documenting clearly as possible and its importance to the officer involved. He also gets into the importance of understanding the physiological effects such as memory distortions and recall, if we are to investigate use of force cases properly. There is also a chapter on Chain of Command responsibilities that every police leader should read, know and apply to use of force cases. I have been a use of force instructor for over 25 years and in my view this is the best book I have read on the topic and I have read a lot. It will benefit greatly the street cop, mid-level leaders, and police administrators. Kevin R. Davis is a 30 year veteran of law enforcement. Currently assigned to the Training Bureau of his mid-size Midwest law enforcement agency he currently instructs in use of force, firearms, tactics and suspect control. Previous assignments include: corrections, patrol, street narcotics investigator, SWAT Team leader and lead instructor. Kevin is a prolific writer contributing monthly columns for Officer.com and LawOfficer.com as well as writing for: Law & Order, Tactical Response, Tactical Weapons, Guns & Weapons for Law Enforcement, The Book of the AR15 and many more newsstand self-defense, law enforcement and firearm publications. Kevin is a member of the International Law Enforcement Educators and Trainers Association (ILEETA), IALEFI - International Association of Law Enforcement Firearms Instructors.